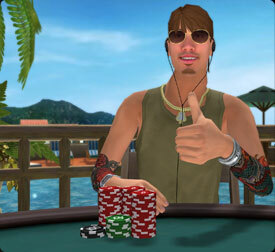 You know all about PKR and its main attraction – the 3D graphics. It’s been in the game since 2004, and never has a rival poker site come close in terms of visuals. Now, this may be because those sites aim to focus purely on the cards. Or it may be because it’s just too difficult for a brand to go heads up against PKR in this particular area of gaming. Who knows? Either way, PKR has it nailed. In fact, the non-poker elements of the PKR package have become so advanced, you could argue that the site’s in a genre of its own – somewhere between PlayStation Home and online poker. I’ll let you decide whether that’s a good thing or not. Long-term members of PKR will already be familiar with the exciting playing environments like Texas Holdem Poker. Personally, I’ve forever been a fan of the home-game setting … though it always makes me want a slice of pizza (and is that Bert from Bert & Ernie in the picture on the wall? I can never figure it out). Today, there are many more environments to which players can escape. And some of these were showcased in the latest TV ads for PKR. If you click the link, you’ll see a press release detailing all the ‘sneakily awesome’ features about the game – including new playing locations (like Paris). The best part about these settings, for me, is how subtly they contribute to the gaming experience. For example, say you’re folded in a six-man single-table tourney and as you wait for the hand to play out, you change the camera angle and see the Eiffel Tower outside the window over your opponent’s shoulder. Lovely escapism. The ability to prompt your avatar so he or she socially reacts in different situations, has always been a major draw for PKR. And this feature has evolved brilliantly over the years. Poker aside, these animations are just hilarious … even when playing on your own. Beyond pure fun, they can also be used to influence the game – as players can disguise their strategies through deceiving character displays. For example, a super-tight player can act like a buffoon and the rest of the table may just have her down as an aggressive fish. This serves one of the top tips for tournaments on how to play poker: convince the table that your play style is the opposite of what it actually is. Now, the top players have a natural ability to ignore somebody spamming the animations in an attempt to get under some skin. And those without the natural ability can immunise themselves by switching the animations off in the settings. Still, when we’re measuring PKR against the term ‘video game status’, then these character simulations have a huge part to play. The physics are smooth and the sheer amount of animations to choose from keep it from getting old. I’ve touched on two major components of PKR as a video game. Can you think of anymore? Would you categorise PKR as a video game or leave it in the online poker genre? Let me know your take in the comments.